“Rosamund” from Tara Lauren is a whimsical , soft flowing beauty. The soft A line gown is embellished with soft guipure lace flowers cross the bodice. 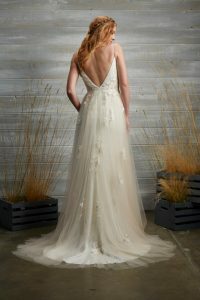 The soft v neckline and low back make this gown a must try on gown. We have one sample gown for sale in ivory /blush in a size US 6 which is an Australian 8.